Let's begin the second half of the of baseball season on a winning note by going west to Oakland. That's where The A's Jeff Samardzija makes his third start since being traded -- or maybe blessed is the better word -- to Oakland from the Cubs. He'll feature in a battle between division leaders East and West as the Orioles visit the A's tonight. Bovada has the A's heavily favored (-157), and really too much to risk. I don't play straight bets when a favorite is above 145, but the total here is very likely to go under Bovada's 7. I don't see it that way, simply because of Samardzija, but his counterpart from Baltimore, Chris Tillman, brings a decent recent track record of his own. I look at the pitcher's last three starts. You can find them on the Bovada data tool at our Home page as one of many valuable resources when handicapping a game. 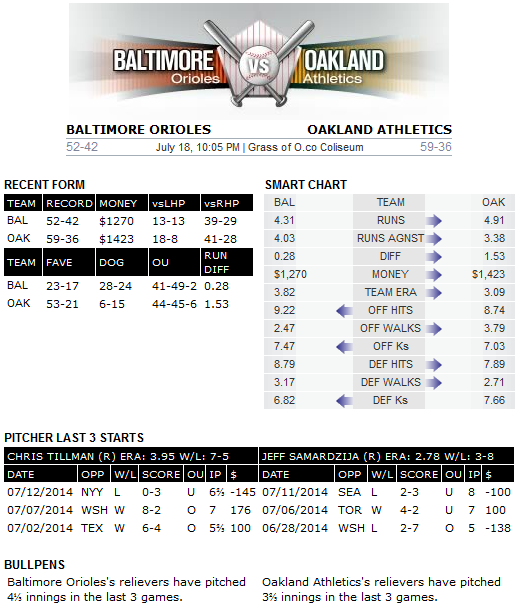 And there you'll see that Chris Tillman of Baltimore (7-5; 3.95) has been holding his own lately, as well. Two of his last three outings listed on the Match-Up page are quality starts, but what you don't see there is that his three starts prior to those were ever better. Since Tillman's one-inning performance on 1 June -- when he allowed five earned runs to Texas -- he's allowed just 13 runs in his next 46⅓ innings of work, dropping his ERA more than a full run. One other significant note: he'll be pitching on an extra day's rest because of the All-Star break. I don't know how much you need to know about Samardzija that you don't already. He was a hard-luck loser in his last time out but has still produced two quality starts in two outings for Oakland since the trade. This will be his first start against Baltimore, which is an advantage that normaly goes to the pitcher ... as if he needs much of one. In our last post, we told you not to be afraid to play the under with this season being dominated by quality pitching (or simply bad hitting), and this one will be a blueprint of just that.